Today I updated Small Sketch app to version 1.2.1. This update has resizing group function. 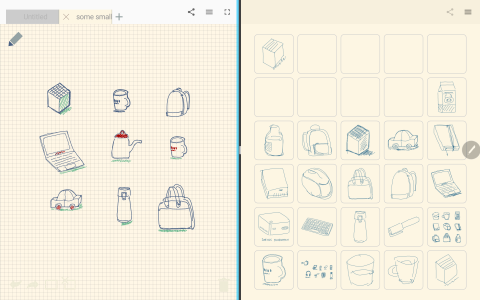 I added clipboard feature so that you can stock some sketches for reuse. This feature has been implemented in Another App Small Sketch Box, now I built it in Small Sketch. Coto Paper can export your sketch as file. This file is gzipped but if unzipped, this is plain text. This plain text data represent your sketch operation one by one from first to last. So you could see the every sketch process if you try. Above movie was created with this file feature. I released Coto Note + version 1.0.3. This update make pen settings tool better. 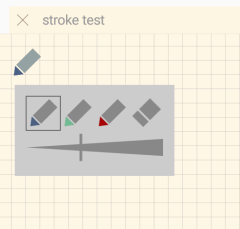 Not only you can change pen or eraser tool by tapping the left top corner pen icon but also you can change pen stroke width. This change make changing pen stroke width easier than before. Yesterday, I released new app Coto Note + on the google play store. This app has the same sketch editing engine of Coto Note. Additinal function of Coto Note + is tab. You can edit multiple notes at the same time. For now this is only advantage of Coto Note + against Coto Note. In the near future, I will add some functions to Coto Note +.